I love projects that you can start and finish within a matter of a few hours (or minutes in this case). These embroidered note cards are fun and easy to make. They’re also great to have on hand to send “thank you” notes or “just because” letters. First, use your pencil and scratch paper to draw out letters or sayings that you’d like to stitch onto your note cards. This step is optional because you could always find a font you like online and print out words/letters to use. I like being able to personalize my cards with my own handwriting. When you get one that you like, cut it out and set the rest aside. 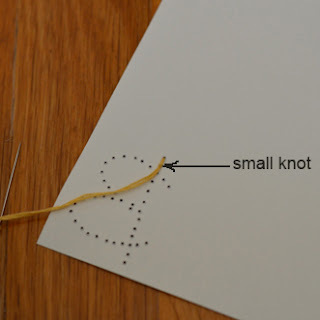 Next, use your needle or thumbtack to poke evenly spaced holes along the lines of your letter. I start by poking holes where 2 lines intersect. Then I poke holes evenly around the rest of the letter. These holes can be spaced however you’d like. I like to keep them close together because it gives more texture in the end because it requires more stitching. Now that you have your template cut out and the holes poked, lay your template on the front of one of your blank note cards. For this example, I chose to put mine in the bottom right hand corner. Use your pen or pencil to make little marks through each hole (this will transfer your letter onto your card). I used a fine tip pen for this step because it made a tiny mark. Next, take your thumbtack or needle and poke holes on your note card where your dots are (just like you did for your template). Now you’re ready to stitch! Be careful not to poke yourself with the needle (I’ve done this and it hurts). Cut an arm’s length piece of embroidery floss. The floss is made up of 6 individual threads. 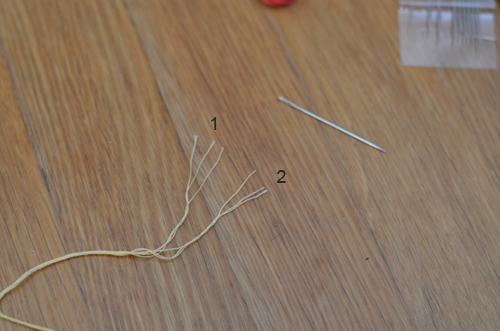 Take one of the ends and separate the thread into 2 sets of 3 individual threads. Separate the threads (untwisting as you go). Now you have 2 arm’s lengths of embroidery floss that are half the “thickness”. Set one aside. Double your floss over on itself and thread your needle. You’ll notice that you now have a loop on one end of your floss. I always stitch in the same direction as how my letter was written. In this case, I draw the vertical line for the B and then draw the two bumps. This is the same direction that I stitched my B. Start your first stitch in the second hole of your letter. Bring your needle from the back up through the hole to the front. Secure the loop at the end of your floss onto your finger so you don’t end up pulling your floss all the way through. Then put your needle down through the first hole. Take your needle through the loop and pull tight. Next, backstitch your way through the rest of your letter. Tie a small knot when you’ve finished your last stitch and bury the end under some of your stitches. When you do this, the back looks almost as good as the front! … Or use this tutorial to make other designs and sayings. The possibilities are endless and they’re quick and fun to make! Enjoy making someone’s day when they receive a hand written note on a hand made card…what could be better!? Love these Shannon! You make it look so easy with your step-by-step instructions! I'm going to try this one day. I love this!! I was at the store just last night looking at Thank You cards but none of them really moved me, so I came home empty handed!